The first ever North American performance of a Sailor Moon musical will be taking place in Houston Texas during the Anime Matsuri convention in April. 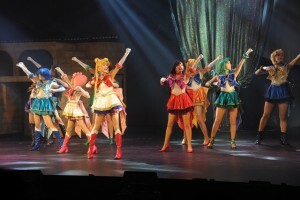 The news of this special performance of the Sailor Moon Amour Eternal musical was posted on the official Sailor Moon site and Anime Matsuri site last month. The specific date of the musical performance has not yet been announced but it will be during the convention weekend which takes place from April 7th to the 9th at the George R. Brown convention centre in downtown Houston, Texas. This may be a slightly modified version of the musical as the entire cast will not be present. At this time only the Sailor Guardians and Tuxedo Mask, with the exclusion of Chibiusa, will be in attendance. 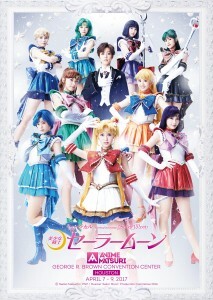 Notice that the poster specifically made for this event features all regular cast members but Airi Kanda who plays Chibiusa. In addition to the musical there will be many Sailor Moon themed guests. 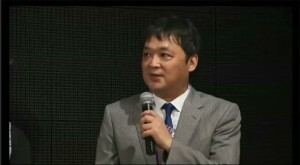 This includes Fumio Osano, Osabu, who is best known as the editor of the Sailor Moon manga. Also appearing are voice actors from the English versions of Sailor Moon Crystal and Viz’s new dub of the original Sailor Moon anime Cristina Vee, who plays Sailor Mars, and Christine Cabanos, who plays Sailor Saturn. Syu Shiotsuki, Sailor Uranus, Sayaka Fujioka, Sailor Neptune, Mikako Ishii, Sailor Pluto, Karin Takahashi, Sailor Saturn, and Yuga Yamato, Tuxedo Mask. 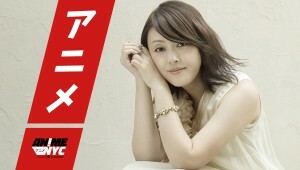 Also attending are dancers Risa Kawamura, Yoshimi Hidano, Ayano Nagasawa and Ayumi Sagisaka. This weekend is Anime Expo in Los Angeles, California. Once again this convention will play host to a number of Sailor Moon actors, this time with a lot of the cast from the new dub of the original Sailor Moon anime and Sailor Moon Crystal. Could this mean we will finally be getting news about the English dub of Sailor Moon S? It’s been a whole year since the voice actors for Sailor Moon S were announced at Anime Expo 2015. We are long overdue to see these episodes. The voice actors will be signing Sailor Moon S art at the convention so I think it would be reasonable to expect to learn something related to Sailor Moon S at Sunday’s panel! 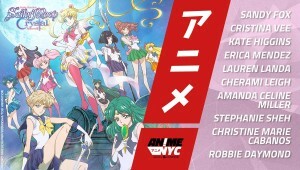 This convention will feature Stephanie Sheh, Sailor Moon, Cristina Vee, Sailor Mars, Amanda Miller, Sailor Jupiter, Cherami Leigh, Sailor Venus, Sandy Fox, Chibiusa, Robbie Daymond, Tuxedo Mask, new voice actors from Sailor Moon S Erica Mendez, Sailor Uranus, Lauren Landa, Sailor Neptune and Christine Cabanos, Sailor Saturn. Most of the events will be going on this Sunday, July 3rd. The Sailor Moon panel will be at 10am Pacific Time and an autograph session will be held at 1:30pm. 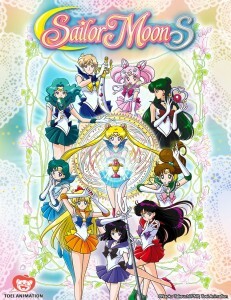 The cast will be signing Sailor Moon S posters provided by Viz.